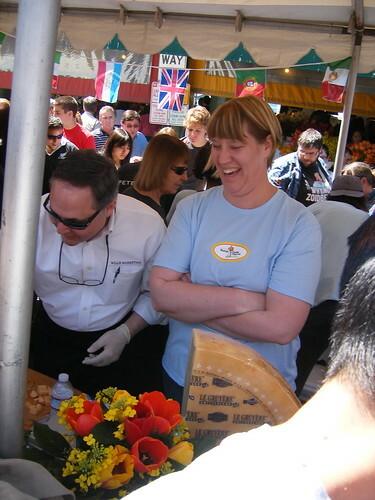 Nicole and I have eagerly been anticipating the Seattle Cheese Fest since we decided we would volunteer back in March. Finally, the weekend arrived and we headed up to Seattle. We stayed with Nicole’s lovely sister and boyfriend who have a sweet apartment in Ballard. Friday night we treated ourselves to some Serious Pie and now I have a very deep crush on that place. Not only were the pizzas excellent and our appetizers delicious but the desserts were sublime. It’s a good thing that I’m already married because their cannoli was amazing. If you’ve been, you know. If you haven’t been, put it on your list already! We got up bright and early and stumbled over to Cafe Besalu for some excellent coffee and fantastic pastries, I had the pear galette and Nicole had the strawberry, fresh from the oven. I love Seattle!! 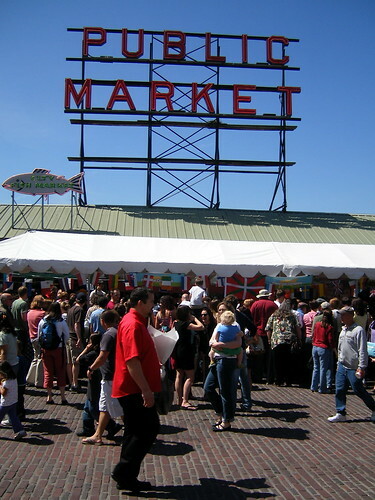 Then we made our way down to Pike’s Place Market. I had not realized when we volunteered that it would be at the Market and when that dawned on me I realized that this was going to be whole different beast. We arrived at the Market, already bustling with activity, got our t-shirts (very cute) and got ourselves introduced to Kim over at the Peterson tent. Kim was basically Julie, The Cruise Director. She was amazing and a flurry of activity and kept things running smoothly at Peterson. She informed us that we’d be responsible for taking the money, making change and fetching cheese. I told Kim that I thought there would be no math on this test! There were five or six pay stations and the volunteers needed to mark on a price sheet which cheeses were being sold from that station and make sure that the cheese stores in the coolers at our feet didn’t get too low. 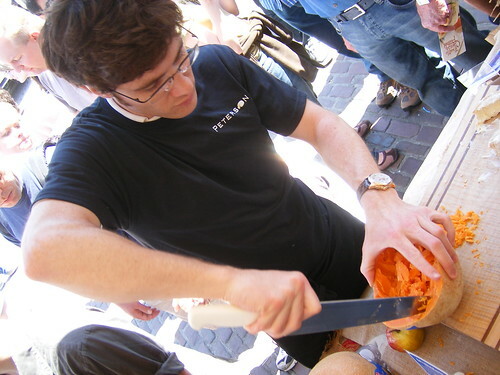 It was just after 9 am and people were already milling around the tent, hunting for samples. 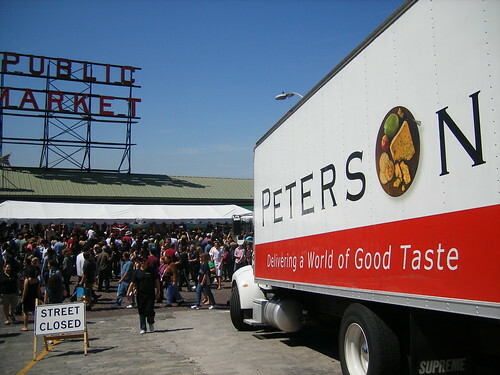 Peterson is a Washington food distributor specializing in cheeses and other fine foods. They had invited the makers of their various excellent cheeses to come out and hand out samples, answer questions and do some quick business. I think all their cheeses were being sold at wholesale so the prices were amazing and cheese was flying out of the coolers. I had a bit of a bumpy start, working with these mischievous French guys and I was kicking myself for not getting a second cup of coffee before we got started. After a couple hours selling camembert (2 for 6 bucks! ), mimolette, ossau-iraty and boucheron — being serenaded continuously by the Ossau-iraty guy (If you were there, you heard him) and attempting to keep on top of the fast-paced camembert sales — Kim came around and switched people up. At first, I didn’t want to move as I felt like I’d finally got into a groove but the move turned out to be a good one. I got set up next to Wendy, a previous year’s volunteer and she was happily sampling cheeses and chatting with the cheesemakers. I hadn’t sampled anything yet so she helped me loosen up and start to really get involved. I started sampling and relaxing a little bit. At one point, I ran down to Nicole and told her to make sure she sampled the cheese! I worked alongside Laura, a delightful woman selling blue cheeses, the creamy and delectable Fourme D’Ambert and the more assertive Bleu d’Auvergne, both from the Auvergne region of France. The Fourme D’Ambert was a big seller at $4 for a half-round but nothing like the Honey Chevre that the next guy was selling for $3! He had creamy chevre from Montchevre creamery out of Wisconsin. The look on people’s faces when they got a sample was great. I ended up filling in on the sample table for the chevre and amusing myself at trying to figure out when was the right moment to tell them that the chevre was only $3 — usually they would raise their eyebrows at their partner or friend and I knew the deal was done. 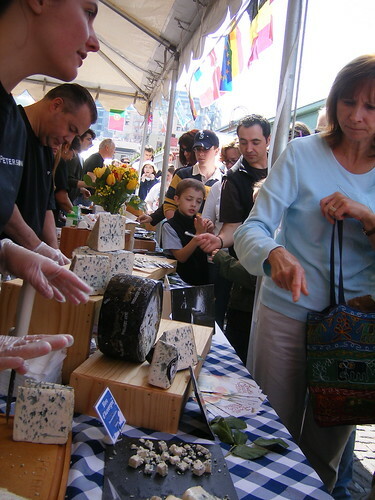 Laura, top left, selling her blues and the Montchevre guy behind her doing brisk business. Eventually, I got into a groove and sampled a ton of Peterson cheese (all top-of-the-line cheese) and also had so much fun answering people’s questions. There were hundreds of thousands of people coming through and tasting cheese. But, I found I had enough knowledge for the novice as well as aficionado that came through the line – I felt pretty good about that. It was a gorgeous and hot day and people could not get enough cheese. The Peterson tent was definitely a high-activity area but stepping out into the crowds and sampling other vendor’s cheeses was something else. After we took a break for lunch (and had some sweet, sweet beer) we hopped in and out of the cheese lines sampling the independent vendors and soaking up the crowd and the gorgeous day. We collapsed at the nearby park with iced coffees and marvelled at how many people were out and how different this event was than the Oregon Cheese Fest at Rogue Creamery. That one was definitely more intimate and easy-going but this one had so much variety. It was a lot of fun and I would definitely volunteer again. Since Nicole was off at the other end of the Peterson tent, I’ll have her explain what her experience was like…. I stuck with the same cheese vendors for my whole shift. In my case, I let the fear of change keep me rooted, but since I was surrounded by really friendly people with lots of fun cheese stories and had finally mastered the math/tally system I’m pretty content with my choice. I was on the other end of the booth from Amanda with quite a variety of cheeses. Our selection ran the gamut from a selection of soft chevre cheeses to a selection of Italian aged cheeses. It was amusing to me that the two most popular cheeses sold at my end were an herbed chevre and a crystal-filled nutty Parmesan. Talk about different ends of the aging spectrum! Nicole got to oversee the cracking open of a HUGE wheel of aged parm. I spent much of my time coming to realize just how small the cheese world really is. In chatting with the reps around me and hearing them trade stories it was apparent that while these guys are often competitors it is a friendly competition that comes from years of working in the same intimate circle. I spend a lot of time focused on small-batch artisanal cheese and this was a really great opportunity to think beyond that close, often local market, to the larger network of high-end quality cheese companies out there. And even these companies often end up being connected to your own backyard. The Arla Cheese rep – who was not only super helpful in getting me acclimated to my volunteer job but was also really friendly and full of all kinds of cheese knowledge and stories – grew up in Tillamook, Oregon! All told this was a great weekend. The food, the people, the accommodations, the cheese and the weather all combined to make for yet another great cheese experience. You can see a few more photos in my Flickr set.